Unfortunately, there have been hundreds of thousands of different-looking labels on recycling bins throughout society, causing public confusion, apathy, and skepticism about recycling. Combine the confusion at the bin with confusion about what materials are recyclable or aren’t recyclable and what we have is chaos and an underutilized opportunity to dramatically improve the world we live in. 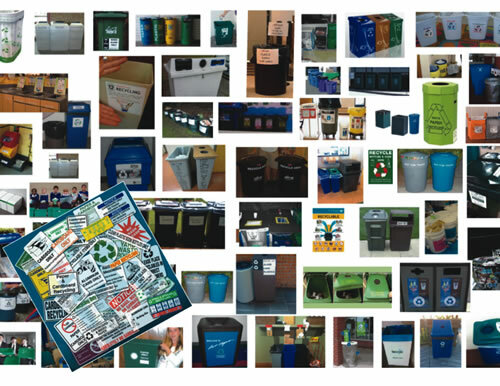 Photo one is what recycling currently looks like for the public. Take a peek: Take a moment to look in any trash bin and recycling bin at the airport, your work, at your children’s school, or anywhere in public. What you’ll see is that the contents inside the trash bin and the contents inside the recycling bin most often look identical. In fact, everyday there are literally millions of tons of garbage being thrown in recycling bins, which cripples the economics of recycling and often makes the recycled commodities unusable for manufacturers. Good news is there’s a very simple solution, and it’s working! 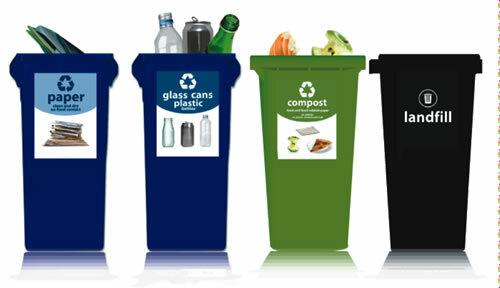 The society-wide standardized labels for recycling bins (www.RecycleAcrossAmerica.org) are the number one solution to help society recycle right! The standardized labels often help improve recycling 50–100 percent and can dramatically improve the profitability of recycling and increase the demand of the recycled commodities by manufacturers. Corporate heroes are helping the next generation recycle right! To date, we have been able to donate 350,000 standardized labels to K–12 public schools throughout the US, thanks to great corporate donors such as Kiehl’s, Bank of America, Whole Foods, Sony, etc. Celebrity-led “Let’s recycle right!” campaign: We’re now launching the celebrity-led “Let’s recycle right!” campaign to help society “recycle right” and introduce the simple solution of the standardized labels. Hedlund will be the keynote speaker at the 2015 WasteCap Nebraska Sustainable Business Awards Luncheon on October 6, 2015, at the Country Club of Lincoln in Lincoln, Nebraska. To register, visit http://conta.cc/1PNwu9j. 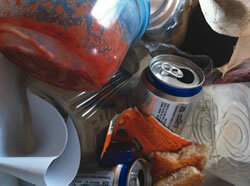 Join us to learn more about the “Let’s recycle right!” campaign and its impact on Nebraska.